What is a Santa Key? Not everyone grows up in a house with a chimney. At Christmastime, this can present a very real problem: Santa will arrive, presents in tow, land softly on the rooftop with his reindeer…and then what? With no chimney to go down, how would he get inside the house? Parents of inquisitive children, rejoice: the Santa Key allows Santa to deliver presents to your house, even if you don’t have a chimney. To make sure Santa knows where to look for the Santa key, have your kids write him a letter with instructions. They can include what they want for Christmas and how good they’ve been this year, too. (A thank-you note from Santa after he uses the key would only take the magic to the next level.) Find some great (free!) printable Santa letter templates here. An Advent or countdown calendar is a great way to build anticipation and excitement before Christmas. Put your Santa Key behind one of the doors of your Advent calendar—Christmas Eve would be a great choice—as a reminder Christmas (and Santa!) will be here soon. This isn’t just any key—this is Santa’s magic key. Make a big deal out of hanging it up. Gather the whole family around, play Christmas music, drink cocoa and eat cookies while you make sure Santa has a way to leave presents for your good boys and girls. However you decide to use it, a Santa Key is a great way to make a magical memory this holiday season. Not to mention a salve for the worries of chimney-less children everywhere. 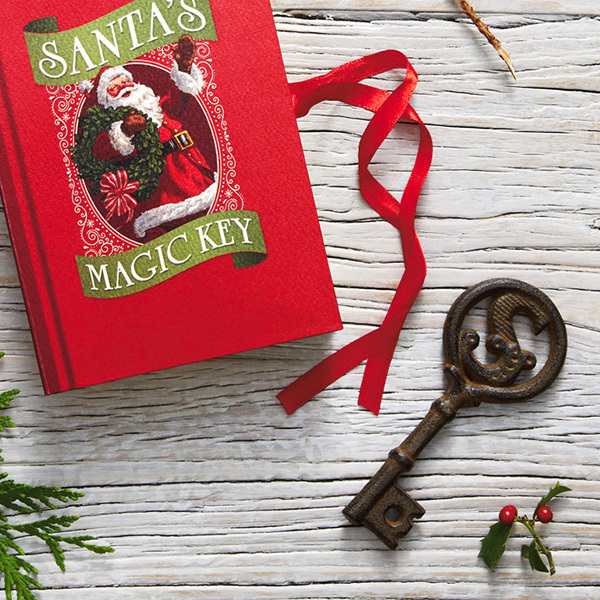 Get Santa’s Magic Key as seen in the Hallmark Channel Original Movie “Christmas in Evergreen: Letters to Santa” on Hallmark.com and at your local Hallmark Gold Crown store.